So tiny, so fragile. NICU (Neonatal Intensive Care Unit) patients require special care to ensure proper growth and development. That’s why PDC Healthcare offers a variety of accurate and reliable NICU Identification wristbands, bar code tags, and accessories made from the softest materials to be as gentle as possible when placed against the NICU patient’s delicate skin. Our Precision® Neonatal Wristbands, constructed of soft, comfortable foam offers newborns and premature infants the highest quality, convenience, and comfort. 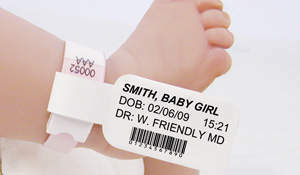 Precision® Bar Code Tags and Conf-ID-ent™ Newborn Identification Tags attach to any wristband making them the most versatile barcode solution for NICU Patients. Their flat surface provides ease of scanning in any position without disturbing the patient. NEW TenderCare® Infant Tether is specially designed to minimize disruptions to a premature patient’s growth by allowing the infant to stay swaddled and still be positively identified. The ultra-soft tether attaches to the infant’s ankle or wristband, and extends outside of the swaddle. Our NICU Identification Solutions meet applicable National Patient Safety Goals of The Joint Commission and other regulatory guidelines. For more information, see our Patient Safety page. Custom imprinting is available upon request.